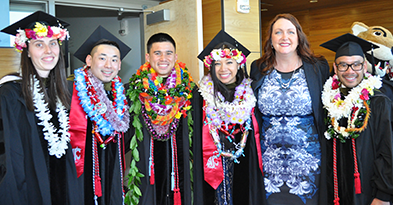 Thursday, May 3, the Washington State University College of Pharmacy celebrated the accomplishments of one Ph.D. and one master of pharmaceutical sciences, and 132 Doctor of Pharmacy graduates at its 2018 Commencement Ceremony. Family, faculty and friends gathered at the Fox Theater in downtown Spokane to honor the new alumni of the college. Former Washington Senator Linda Evans Parlette gave the keynote address and shared insights as a pharmacist advocating for public health while serving in the state legislature. “The pharmacist of today will be known as part of a patient management team, and not just in hospital or clinical settings,” Parlette said. SPOKANE, Wash.—The Washington State University College of Pharmacy recently named Sunil Wadhwani and Leon Alzola to the advisory council for Dean Gary M. Pollack. SPOKANE, Wash.—Linda Evans Parlette, a former Washington state senator and WSU pharmacy alumna, will be the keynote speaker at the commencement ceremony of the Washington State University College of Pharmacy at 1:00 p.m. Thursday, May 3, at the Martin Woldson Theater. 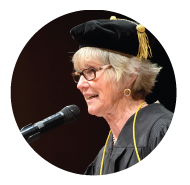 Parlette’s selection as the commencement speaker for pharmacy maintains the college’s practice to bring thought leaders to campus. Her record in state government is in alignment with the college’s position as a leader in advancing, promoting and protecting human health. In November 2017, the WSU Board of Regents voted to approve a change to the official name of our college from the College of Pharmacy to the College of Pharmacy and Pharmaceutical Sciences. Updating our name was important in order to better communicate our balanced mission to advance human health through excellence in collaborative research, scholarship and clinical education, and develop outstanding health care professionals and scientists. Anjie Bertramson was selected by Washington State University for the January 2018 Crimson Spirit Award. The Crimson Spirit Award is a monthly recognition award for individual employees who provided exceptional service and exceeded expectations while representing WSU either internally or externally. 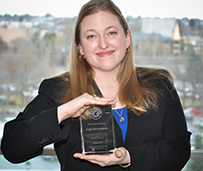 Bertramson was recognized for outstanding contributions to the WSU community. 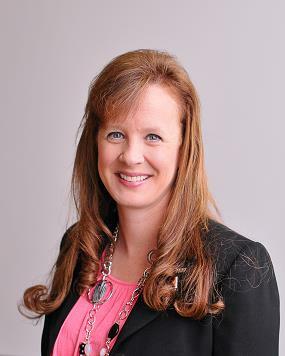 The Washington State University College of Pharmacy has hired three new people to support and develop the experiential education portion of its Doctor of Pharmacy program. These positions coordinate and oversee the introductory and advanced pharmacy practice experiences offered to WSU student pharmacists across the states of Washington, Oregon and Northern California, and internationally. The College of Pharmacy is committed to providing a high-quality and transformative educational experience for its students. Experiential education is essential to developing practice-ready graduates who are prepared to deliver innovative and patient-centered care as part of a health care team. Google. Amazon. Warby Parker. These disruptors of business and industry have some common characteristics: innovation in thinking, transformation of the status quo, flexibility in their growth. These traits are not necessarily associated with institutions of higher education, especially ones who may have just celebrated a 125-year history, but our vision is to be a leader in advancing, promoting and protecting human health. To be true to that mantra while educating outstanding health care professionals and scientists, we have chosen to lead by example and make a trail that can hopefully guide others to join the movement in transforming health care education for the better. 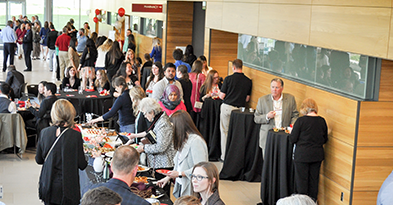 The Washington State University College of Pharmacy celebrated with alumni and donors at its annual spring recognition event, Friday, April 21, on the WSU Health Sciences campus in Spokane, Washington. SPOKANE, Wash.—Thursday, May 4, the Washington State University College of Pharmacy celebrated the accomplishments of four Ph.D. and 92 Doctor of Pharmacy graduates at its 2017 Commencement Ceremony. Faculty, family and friends gathered at the Fox Theater in downtown Spokane to honor the newly minted alumni of the college. American Pharmacist Association CEO Tom Menighan gave the keynote address and urged the graduates to find their passion within pharmacy. 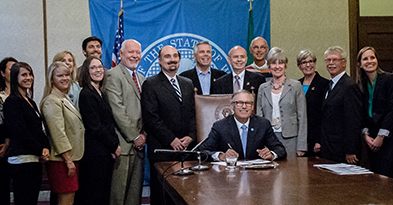 “Those who build connections and continue their lifelong learning will excel,” he said.